“Where to begin? Ah yes, at the beginning.” – Bilbo Baggins. Between roughly 30-40,000 years ago (+/- a few millennia) somebody got the idea to create art. Thus began human beings. Who knows what sorts of wood carving, bark weaving, or natural dye paintings have decayed into nothingness over the centuries. About all that remains are cave paintings, bone etchings and, of course, clay figurines. Imagine being the very first person to pull a ceramic object from a fire pit. You just transmuted one material into an entirely different one – on purpose. People had used clay to line fire pits, make adobe bricks, and even to model animals (they still sit, unfired, in some of those ancient caves) for a few thousand years before this moment. But in what is now eastern Europe, something new happened. Thousands of clay pebbles were made specifically to toss into the hottest parts of an open hearth fire. Some exploded, others didn’t. Divination, perhaps? Or just entertainment – the thrill of pre-historic fireworks? These same forgotten people also made little clay figures and tossed them into the fire. The figurine shown here is a survivor of that pit, and of the ensuing 25,000 years. It was uncovered near the Czech village of Doln Věstonice in 1925. It’s small, like the many other ceramic objects found at the site. About 4.4. inches tall by about 1.7 inches at its widest. 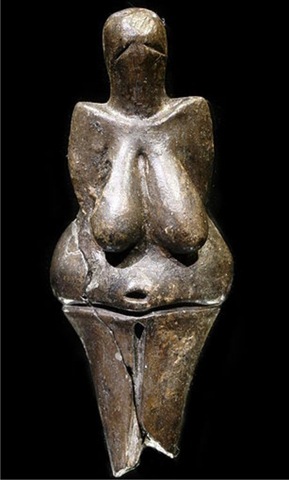 This figurine has been dubbed the “Venus of Doln Věstonice.” It is the most evocative Paleolithic sculpture yet unearthed. To a modern eye it represents a sophisticated reduction of elements to the utmost essentials. When looking at this object, the overwhelming impulse is to ask “why?” And “why” is the most powerful word ever devised. People will wonder into the unimaginable future why the Venus was made. There will never be an answer. I’m content just looking at this awe inspiring figurine as if I’m looking directly into the eyes of the first real humans. Shivers. The Emergence of Pottery. Barnett and Hoopes, eds. Smithsonian Press/Washington DC. 1995. You are currently browsing the archives for the Paleolithic art category.